The folks of Fort McMurray in Alberta Canada have been living with a disposable bag ban for about 9 months, and while there have been some bumps in the road things are going very well. Fort McMurray is about a 5 hour drive northeast of Edmonton and in 2010 the regional council unanimously voted to ban single use plastic and paper shopping bags after the residents handed over a petition in favor of a ban with 2,300 signatures. The ban went into effect in September of 2011 and the rest is history. Fort McMurray’s ban only extends to plastic bags given out by retailers; liquor stores, pharmacies, and some restaurants are still allowed to distribute single use plastic bags. This story is so inspiring because the people made up their mind, took action, and successfully managed to make the ban a law. These days’ residents rely on bags that are reusable to carry their goods home and there are far fewer disposable plastic bags in the nearby landfill and littering the streets and communities. Local businesses impacted by the ban have embraced it, and this is a crucial step in the success of the plastic bag ban. Drop Dead Darlings, a boutique clothing store in town gives customers a free reusable bag when the make a purchase over $100. This promotion is a great way to give the customer something extra and help establish loyalty, but it is also a fantastic way to increase the brand’s visibility and get the store named noticed. Shoppers who do not qualify for a free reusable bag can purchase one for $3. Either way, when customers carry a reusable bag imprinted with the store name (which they are much more likely to do these days since plastic bags are a no-no) they become a mobile billboard and advertise for the store. These are rookie mistakes that hopefully overtime will be corrected as habits forms and grabbing reusable bags when heading to the store becomes second nature. Forgetting to bring reusable shopping bags is a major hassle many people have when bans are first implemented. Not bringing enough bags is also a completely understandable slipup; you know what you need when you walk into the store, but it can be hard to visualize how many reusable bags it takes to carry everything on your list. As using reusable bags becomes second nature the residents will get better at estimating how many items can fit into their bags, so making sure they have enough will be easy. Mercer estimates she has about 60 reusable bags and she is more concerned about the amount of space the bags take up under her kitchen sink than she is about the money she spent purchasing the bags. Mercer is not alone in this so called problem – many Fort McMurray residents find they have more reusable bags than they need. This is a unique and unanticipated problem – typically a major criticism against plastic bag bans is that the cost of reusable bags can add up and pose a financial burden to residents. Since many people in the town are amassing a large collection of bags they should consider maybe stashing some in their vehicle so if they make an unplanned trip to the store they are prepared. It may also be handy to maybe keep a couple bags on standby at the office. Reusable bags can be used for so much more than carrying groceries home – they are great for carrying a dish to a potluck, they make handy lunch totes, reusable bags are convenient for lugging work home or carrying a laptop. The durable design also makes them great gym or beach bags. 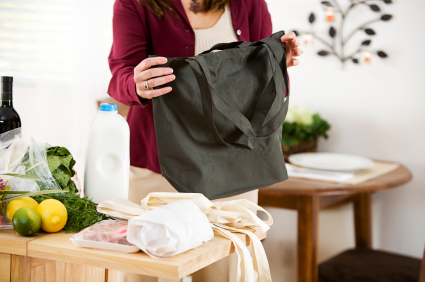 Once a reusable bag is used for something other than groceries it needs to stay off grocery detail. It is pivotal that a bag used to carry food is not mixed with other bags. All reusable bags should routinely be washed, but still make sure to only use dedicated bags for trips to the supermarket. It may be helpful to label bags with a permanent marker or add some type of embellishment to clearly identify what the bag is used for. Reusable bags are typically priced very reasonably; however, what is reasonable to some may not be so for others. People who are able to splurge on the purchase for an extra bag when they find themselves without are fortunate. Not everyone is so fortunate, so if Fort McMurray residents find themselves with an unwieldy reusable shopping bag collection they could consider donating extra bags in good condition to those less fortunate. Families facing financial hardships may have to think twice before purchasing reusable bags that can cost as much as $3. By donating extra bags to shelters or agencies that help the less fortunate the people of Fort McMurray can help their neighbors, coworkers and friends while they also help the planet. To read more about Fort McMurray go to http://www.fortmcmurraytoday.com/ArticleDisplay.aspx?e=2214180&archive=true and http://www.vancouversun.com/news/Fort+McMurray+life+goes+after+plastic+bags/6747642/story.html.